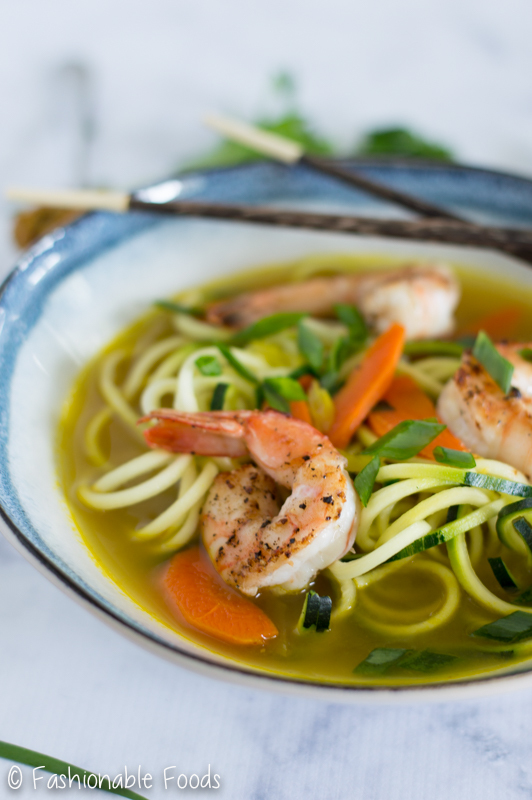 Zucchini noodles are swimming in a spicy curry broth and topped off with seared shrimp in this quick and easy meal. 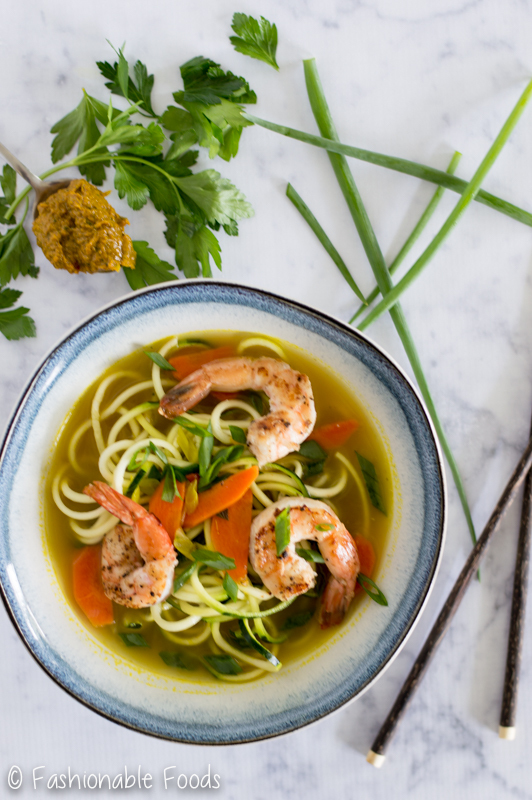 Delicious and healthy, this curry zoodle soup is sure to be a hit! Guys, can you believe it’s June?! We are close to being halfway through 2017. Whaaaaat?! That’s just crazy to me. Anyway, did you have a nice weekend? I had a fantastic weekend, thanks for asking. ? 3 of my best girlfriends came to visit… we ate lots of good food, drank lots of wine, and hit the beach on Sunday! We also laughed… a lot. I was sad to see the weekend end, but here we are back to the grind. 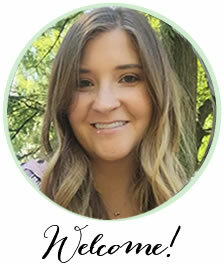 Luckily I have a delicious recipe to share with you! This one is perfect as we approach summer since there will tons of fresh zucchini. You all know about my obsession with zucchini! ? 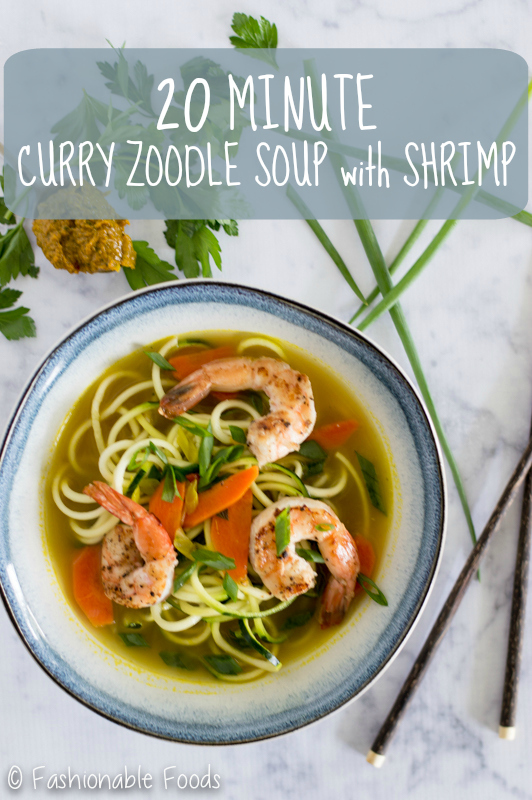 This curry zoodle soup with shrimp is packed with flavor, super simple, and it only takes 20 minutes! What more could we ask for? I just love quick and easy recipes! We start this recipe with shrimp. I absolutely love shrimp because they are quick-cooking, which makes them perfect for 20 minute recipes! However, if you’re not a fan you can always toss in some shredded chicken, or even add more veggies if you want a vegetarian version. Sear the shrimp in a large skillet or wok and then set ’em aside while you make the broth. The broth is SO simple, but packed with flavor! Simmer together chicken broth, curry paste, and carrots. After 15 minutes your broth will be ready and you’ll add in coconut amigos for a little sweetness, fish sauce for saltiness, and lime juice for a little extra zing. All the flavors work so well together! 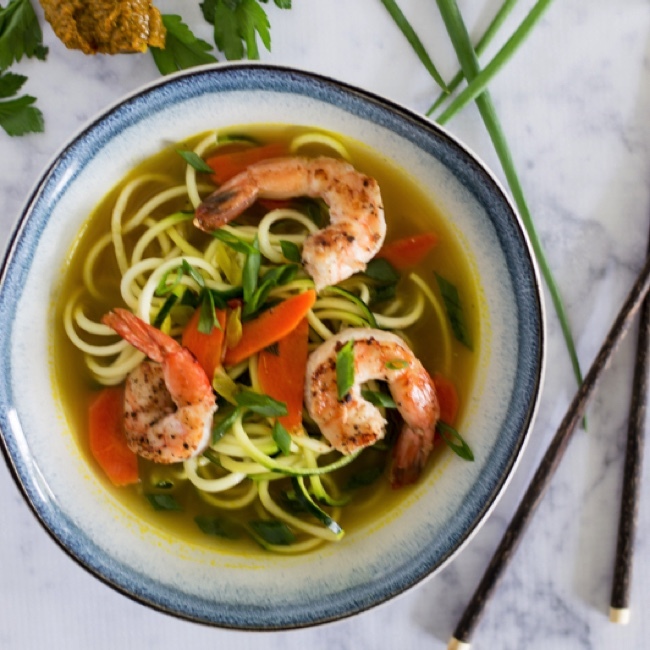 Grab your spiralizer and make your zucchini noodles, pile them up in bowls and pour the broth and shrimp overtop. Top each serving with scallions and cilantro and get ready for flavor explosion! 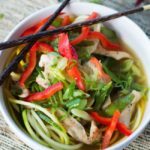 When it comes to using zucchini noodles in soups, I prefer them raw. I find if you add them into the broth and let them simmer, they end up turning to mush. By pouring the broth over the zoodles they hold their shape and stay crisp. If you want to take that crunch away, just let the zucchini noodles sit in the broth for a few minutes in your bowl before digging in. A quick note on the curry paste – I use homemade yellow curry paste. I’ve never been able to find a store-bought yellow curry paste, but making it is really simple! I use this recipe from Pinch of Yum. 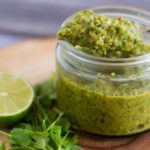 If you don’t want to make your own or are in a pinch, you can use red or green curry paste. I recommend starting with 1 teaspoon and tasting the broth before adding anymore. 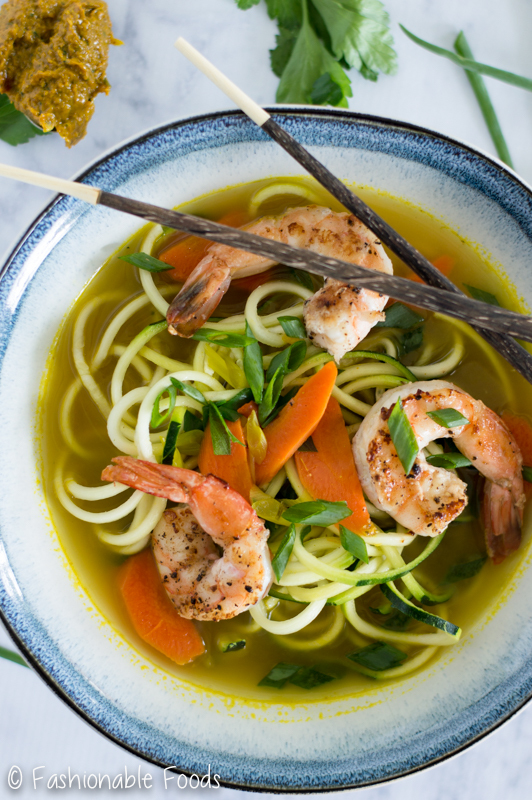 Just a handful of ingredients are all you need to make this quick and simple curry zoodle soup! It’s the perfect summer soup since it’s so fresh and only requires 20 minutes of your time. And, I don’t know about you, but I love a good summer soup. Soup isn’t just for winter, people! In a bowl, combine the shrimp with the olive oil and season generously with salt and pepper. Heat a large skillet or wok over high heat. Once the pan is very hot, add in the shrimp and leave untouched for 1 minute. Flip the shrimp and cook for another minute or so until the shrimp are opaque and cooked through. Transfer to a plate and set aside. Pour the chicken broth, curry paste, and carrots into the pan and stir to dissolve the curry paste. Bring the broth mixture to a boil and then reduce the heat to low. Allow the broth to simmer for 15 minutes and then stir in the coconut aminos, fish sauce, and lime juice. Taste the broth and season with salt and pepper, if needed. Add the shrimp into the broth to warm through. 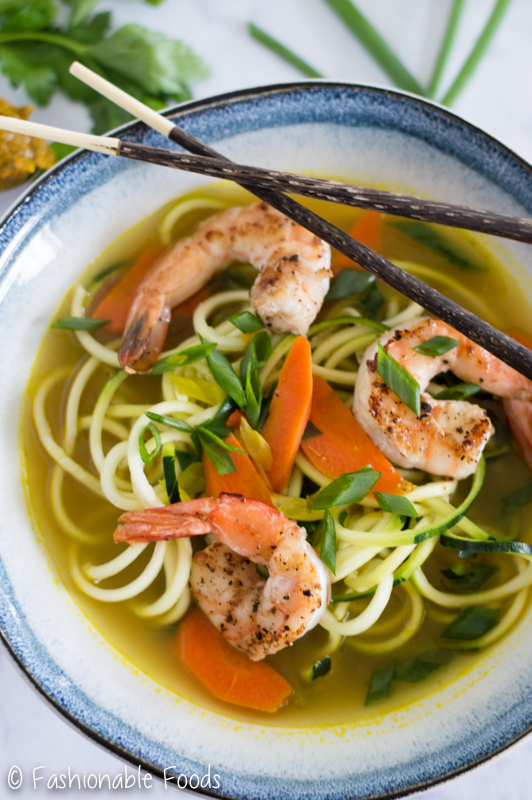 Divide the zucchini noodles among 4 serving bowls and top each with shrimp. Pour the broth equally over zoodles, top each portion with cilantro and scallions and serve! How fun that your 3 friends came to visit! Your day at the beach sounds amazing! And I don’t think I’ve ever seen zoodles in soup before so cheers to you for your creativity! 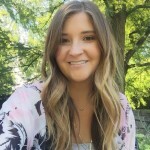 I love this easy meal! And I could eat soup pretty much every day, so this is calling my name. I love the zoodle and shrimp combo, Keri! Looks so good! 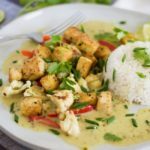 I am SUPER in love with anything curry, and I love that you use homemade yellow curry paste here! This soup looks so delicious.